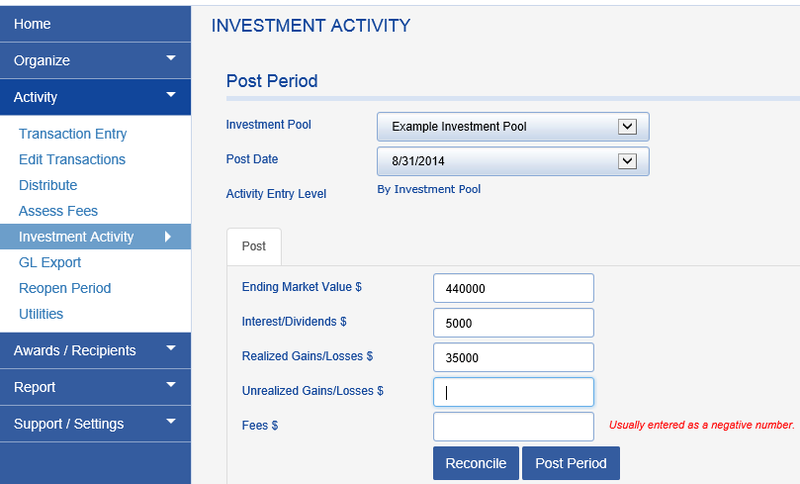 A system for tracking the value of endowment funds within a consolidated investment pool. A unitized system has mechanics similar to that of a mutual fund. Each endowment fund owns individual units (shares) in the unitized investment pool, and the units are generally valued monthly. The unit value, or unit price, is similar to the share price that forms the basis for how many shares can be purchased in the mutual fund model. New endowment funds, and new gifts to existing funds, buy units in the pool based upon the current unit value. Funds withdrawn from an endowment pool sell units based upon the current unit value of the pool. The units, which represent the fund’s share of a unitized endowment pool, form the basis for allocating endowment pool earnings. Endowment pool investment earnings are allocated to funds proportionally based upon their share (units) in the pool. Fundriver provides several options for unitizing. The most commonly used models available in the program are shown below. Custom unitization models are also possible. The unitization model adopted by a client determines the timing that is used when buying/selling units. Beginning of Month (BOM): Units are bought and sold at the beginning of period unit price after the allocation of investment activity for the period. This is the least commonly used unitization method among Fundriver users and not recommended as it causes a re-balancing to Unrealized gains/losses. Because new units also buy in or sell at the beginning of month unit price Fundriver will automatically do this re-balancing adjustment to tie out for end of month unit price calculation (EOM Unit Price * New units purchased at BOM unit price) and tie out to ending Market value. Beginning of Month 2 (BOM2): New Gifts receive units based on the unit price from the prior month end. Investment earning are allocated based on the new unit balance after gifts are unitized. The important distinction is that gifts receive an earning allocation in the same posting period. This is the most commonly used unitization method among Fundriver users. End of Month (EOM): Earnings are allocated based on the prior month-end unit balance. New gifts receive units based on the new unit price at the end of the current posting period. The important distinction is new gifts receive an earnings allocation in the subsequent posting period. An Example: A pool is established with four endowments, each of which contribute $100,000 to the pool. The beginning unit price chosen is $1,000 per unit (Fundriver usually uses $100 or $50, but for the purposes of illustration a four-figure number works better). 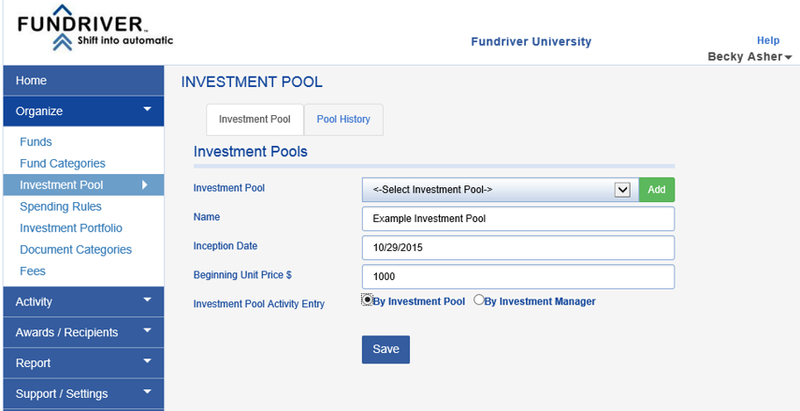 New investment pools can be established in Fundriver by navigating to ORGANIZE > INVESTMENT POOL and clicking on the green ADD button. Using the beginning unit price and initial contributions, Fundriver is able to unitize the pool and calculate the number of units owned by each endowment. Let's say that the following month, the market value of the pool is now $440,000. The pool value has increased by $40,000. Since income/gains impact unit price, the value of each unit in the pool will increase. The following period, a new endowment is added to the pool, also valued at $100,000 (Endowment E). Because the Unit Price is higher now ($1,100 per unit), $100,000 will only buy 91 units ($100,000/1,100). The total in the pool is now 491 units. When it is time to allocate income again, let's say the market earned another $40,000. This will increase the unit price to $1,181. Now it is time for spending distributions to be made from the same pool. Spending distributions typically sell units. In this example, the pool's spending calculation indicates that $29,537.04 needs to be distributed from all funds in the pool. $29,537.04 (decrease in market value)/$1,181.48 (unit price)=25 units that need to be sold. To figure out how that is allocated across the funds, you need to figure out what percentage of the pool is owned by each fund and then multiply that by the 25 units that are to be sold. Fundriver decreases each fund by the number of units calculated. If you need additional assistance with understanding unitization and how it works in Fundriver, please contact your Client Support Specialist.